Today the Georgian church comemmorates the life and work of Saint Joseph, Bishop of Alaverdi. Saint Joseph was one of the Thirteen Holy Syrian Fathers, the founders of Georgian Monasticism. It is unknown as to whether they were Georgians from the Diaspora, Assyrians or Greeks, but they developed renown in Georgia for their dedicated evangelism in an early stage of Georgia’s Christian development. As we have mentioned before, Georgians have had a profound effect upon the development of Orthodox Christianity outside the country. 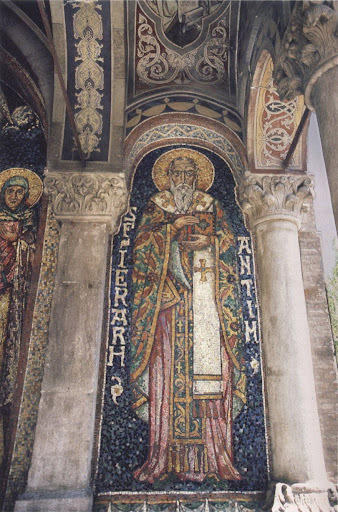 A notable example is Saint Anthimos, a Georgian taken into slavery by the Ottomans who later became a priest of great renown in Romania. He was later martyred by the Turks. 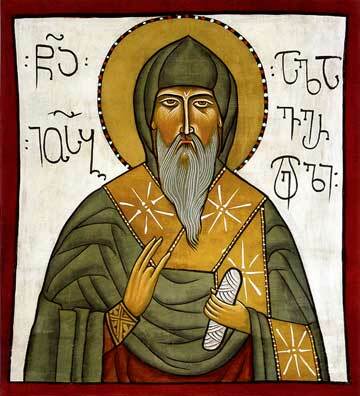 In the Romanian church, his Feast Day is today, September 27. The article is provided with the kind permission of John Sanidopoulos. Saint Anthimos was born in Georgia, and his parents were called John and Mary. The child received the name Andrew in Baptism, and his parents raised him as an Orthodox Christian. Around 1690, Andrew was invited to Wallachia by Prince Constantine Brancoveanu (August 16), who had heard of his talents. After a year or so, he became a monk and received the name Anthimos. Later, he was ordained to the holy priesthood. He was placed in charge of the royal print shop in Bucharest, and later set up a printing house in the Snagov Monastery. The monastery printed sixty-three books in Romanian, Greek, Arabic, and Georgian. St Anthimos was the author of thirty-eight of them. He was chosen to be the abbot of Snagov in 1696. 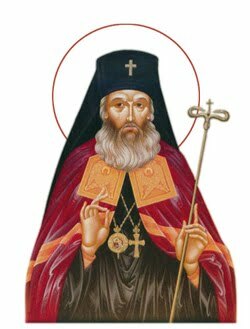 The saint was consecrated as Bishop of Rimnicu-Vilcea in 1705, and three years later he was made Metropolitan of Wallachia. As Metropolitan, he established schools for poor children, and built churches and monasteries. Since he was a woodcarver, he used his talent to beautify many churches. 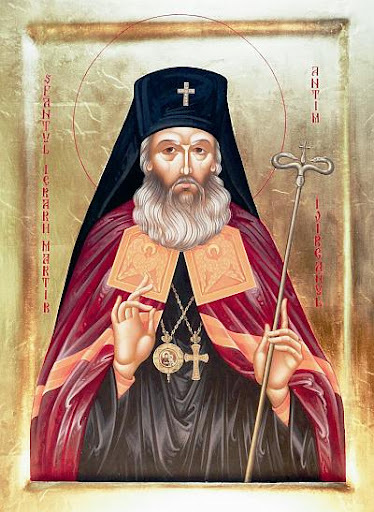 St Anthimos was a zealous pastor who satisfied his flock’s hunger for spiritual knowledge. Preaching in the Romanian language, he taught them the saving truths of Orthodoxy, and offered words of encouragement and consolation. His edifying books and sermons are part of the spiritual legacy of the Romanian Orthodox Church. 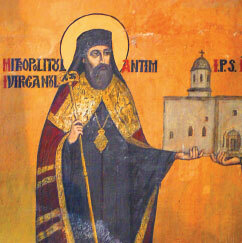 Metropolitan Anthimos was arrested by the Turks in 1716 and sentenced to be exiled at St Katherine’s Monastery on Mt. Sinai, but he never arrived at his destination. On September 27, 1716, he was killed by the soldiers who were escorting him. They cut his body into little pieces and threw them into the Tungia River, south of the Danube. Thus, the faithful servant of Christ received the crown of martyrdom. St Anthimos was a true shepherd of his flock, and a father to his clergy. He was glorified by the Orthodox Church of Romania in 1992. For various videos having to do with St. Anthimos, see here. Saint John Chrysostom was Patriarch of Constantinople in the 4th century and one of Orthodox Christianity’s greatest theologians, liturgists and orators. For this reason, he received the moniker “Golden-Mouth” (Chrysostomos in Greek). He died in the Gagra district of Georgia. Of Greco-Syrian background, Saint John Chrysostom was born in Antioch and ordained as a deacon there in 381. In 386 he became a priest and was famed for over a decade as an eloquent orator. His homilies are still widely recited at Orthodox churches during the sermon. His particular passions were compassion for the poor, for Christians to lead simple lives, and straightforward interpretation of Holy Scriptures that common people could comprehend. Against his wishes, he was appointed Patriarch of Constantinople in 398, where he continued to preach against extravagance, which created hostility amongst the gentry and the Imperial family. The Eastern Roman empress, Eudoxia, in particular developed a grudge against him. Concurrently, the Patriarch of Alexandria, Theophilus, at the time wanted to depose John and control Constantinople himself. 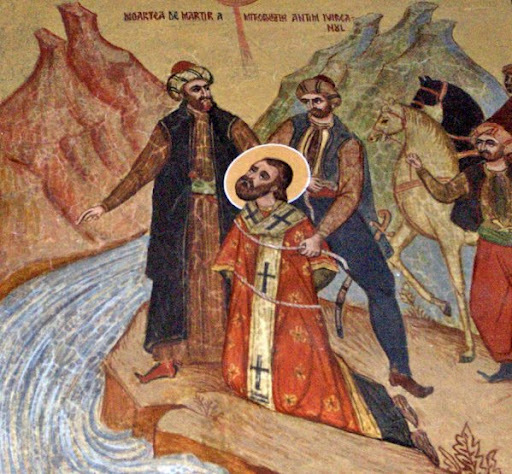 As a result, a rigged Synod was called; Saint John Chrysostom was deposed for heresy and banished to Armenia. He continued to write letters to his flock in Constantinople, for which he was further banished to Georgia. He died near Bichvinta (Pitsunda in the Abkhaz language) in the Gagra district of Georgia’s Abkhazeti region in 407. A cathedral in his memory was commissioned by King Bagrat III of Georgia in the 10th century in Bichvinta, which still stands. Saint John Chrystostom was declared a saint not long after his death and his remains were eventually repatriated to Constantinople. They were looted as trophies by Roman Catholic Crusaders in 1204 and taken to Rome where they were installed in the Vatican. As a gesture of goodwill, the Pope of Rome returned these relics to Constantinople in 2004. 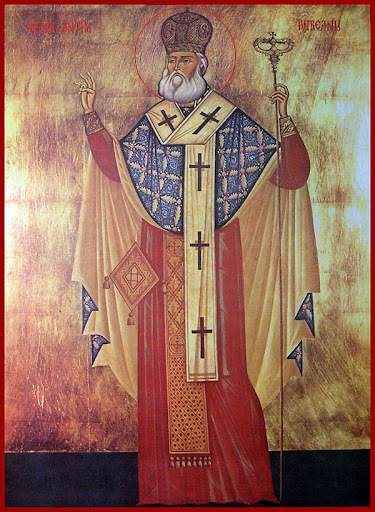 Saint John Chrysostom has great significance in Georgia. His Divine Liturgy was translated into Georgian soon after his death and is now the standard service performed on Sunday mornings throughout the country. His Paschal Homily is recited at every Orthodox church in Georgia at Easter. The place of his repose in Abkhazeti was a place of pilgrimage for Georgian Orthodox Christians for centuries, a tradition sadly impeded by Russian occupation now. His coffin, no longer in use, is still on display. 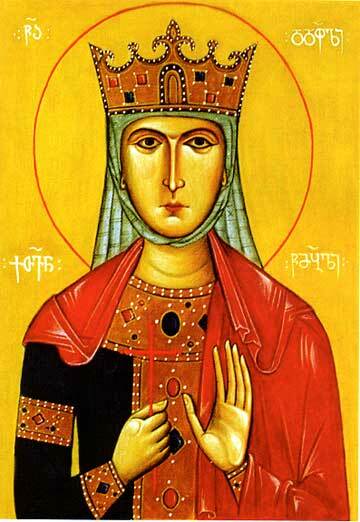 Today is the Feast of Saint Queen Ketevan of Kakheti. Early in the 17th century, Shah Abbas the Great of Persia embarked on a series of campaigns to subjugate Eastern Georgia. He was helped by the defection of Giorgi Saakadze, a prominent general in the service of the young Georgian monarch, Luarsab of Kartli. Saakadze guided the Shah’s armies, which vented their fury on Eastern Georgia; churches were devastated, icons and crosses broken up and the jewels given for ornaments to the Shah’s concubines. Many people saved themselves by fleeing to the woods and mountain strong-holds, but at least sixty thousand were massacred. The rest of the population was deported to remote parts of Persia. King Luarsab of Kartli was sufficiently trusting to accept the Shah’s offer of peace negotiations; on arriving in the Persian camp he was arrested, and later strangled near Shiraz. The other ruler of Eastern Georgia, Teimuraz I of Kakheti, preferred resistance, and allied himself alternately with the Russians and the Turks to carry on guerrilla warfare. In revenge, Shah Abbas castrated the two young sons of Teimuraz whom he already held as hostages. To the mother of Teimuraz, the Queen Dowager Ketevan, whom he also held in his power, he offered the chance of adopting Islam and entering his harem. On her refusal, she was cruelly martyred at Shiraz on September 22nd, 1624. A contemporary account of her martyrdom in 1624 was dispatched to the Vatican by Roman Catholic missionaries present in Shiraz at the time. The account is presented below. After Queen Ketevan was conducted to Shiraz, Brother Ambrose, who was then in that town, entered into contact with her and also with all the members of her household, who numbered about forty. They used to come to Mass at Brother Ambrose’s church, and showed a great leaning towards the Catholic religion. Queen Ketevan sent to tell Brother Ambrose that she wished him to confess all her retinue (luring Lent; on the day of his patron saint, St. Augustine, she sent him from her chapel and oratory some pictures, candlesticks and carpets to adorn the church, as well as one of her men who could model wax, to make candles and tapers. While Brother Ambrose was entertaining great hopes of harvesting the fruit of his fatigues through the conversion of these persons, the King of Persia sent certain of his minions to Shiraz; they were instructed to tell the Georgian queen in his name to become a Muhammadan, and that he would take her as his wife and give her great riches. If she refused, they were to put her to death with great torments. The queen replied that nothing on earth would make her abandon the faith of her Saviour, our Lord Jesus Christ, nor her chastity, which she valued more than all the theatres in the world. The officials begged her again not to expose herself to suffer such tortures, and to have pity on her tender flesh; but nothing could shake her constancy. When they saw this, the officials, after striving in vain to persuade her, told her to prepare to suffer the torments, and she asked for permission to say her prayers. This being granted, she entered her chapel, went down on her knees and prayed our Lord God to accord her His grace, to give her strength to suffer all these tortures for His holy faith. When she had committed herself to God’s keeping she went out and told the minions that they might do what the king had commanded. The officials begged her afresh to have pity on herself a weak woman, and not to condemn herself to so miserable a death. The queen replied that they might give up trying to persuade her, for it was time wasted. The officials had already lit a great fire and inserted iron pincers into it, which were now as hot as the fire itself. They stripped the queen from her neck to her waist, and taking the red-hot pincers, they tore away the flesh from her delicate body with great cruelty, until at last the queen fell half dead to the ground, though continuing to invoke our Lord God with the greatest courage and fortitude. When she had fallen to the ground, they picked up the whole brazier and threw it on her body, anti finally put her to death by strangling her with a bowstring. Her steadfast refusal to abandon her faith in the face of torture and death have been recapitulated by Georgians for centuries. Being wounded by divine zeal, thou didst receive many wounds and endure multifarious tortures. O thrice-holy Ketevan, intercede with Christ God to have mercy on our souls. and now standeth before the Holy Virgin interceding for us all. September 27 is the Feast of the Elevation of the Holy Cross. After the Crucifixion of Christ, His cross and that of the two thieves crucified with him were lost. Saint Constantine the Great, Roman Emperor, legalised Christianity within the Empire by the edict of Milan in 313. He was no doubt influenced strongly by his mother, Empress Helen, who was renowned as a pious Christian. Amongst her many missions and pilgrimages was the discovery of the cross upon which Christ died, on Golgotha hill in Jerusalem. Tradition states that Empress Helen found a cluster of flowering bushes on Golgotha, known by locals as “Vasilikos” (what we now know as Basil). In Greek, the word “vasil” indicates kingship. Upon excavation beneath the bushes, three crosses were found, along with a sign inscribed with “Jesus of Nazareth, King of the Jews”. To determine which cross was that of Christ, a sick woman kissed each cross and was cured by the last that she kissed. A dead man, being borne to his tomb by a funeral procession, was laid across the same cross and was restored to life. With great joy, the Cross was elevated from a high platform for the whole population of Jerusalem to witness and venerate. The True Cross was looted from Jerusalem by Persian troops as a trophy in 614. It took until 630 for Byzantine forces under Emperor Heraclios to retrieve it by force from the Persian capital Ctesiphon, return it to Jerusalem, and to reinstall it in the Church of the Holy Sepulchre . The Feast on September 27 celebrates both of these events. Today marks the Feast of the Birth of the Virgin Mary. As the human being closest to God the Son, the major events of her life are closely followed in the Orthodox Church. Roman Catholic doctrine is that the Virgin Mary was herself the product of a virgin birth. This position is not accepted by the Orthodox Church and is seen as an innovation. While the parents of the Virgin Mary, Joachim and Anna, are seen as saints and honoured by the Church, they are not understood to be sinless. Vespers (evening service) is held the night before the feast, and Divine Liturgy is served on the day of the feast, even if it is a weekday. The Early Church Fathers were very vocal on the significance of this feast; some quotations are provided (with thanks to John Sanidopoulos for the quotations). * O mystery brought about on earth! After the birth, Anna prayed to our God and Maker Who knows all things in advance: “You have heard me, O Lord, as you have heard Hannah who was accused before Eli of being drunk” [1 Sam. 1:14]. She promised Samuel, after his birth, to the Lord to become priest. Just as formerly you have given me too a gift, the barren woman gives birth to the Mother of God and the nurse of our life. 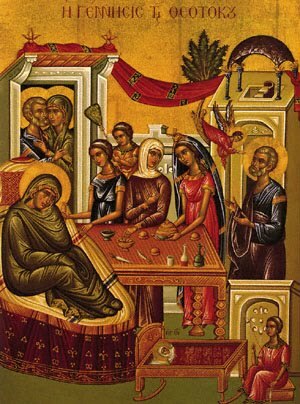 * As foretold by the angel, today have you come forth, O Virgin, the all-holy offspring of righteous Joachim and Anna…you did destroy the curse and give blessing in its place. * No more are the gifts of Joachim turned away: for the lament of Anna is changed to joy. “Let all the chosen of Israel rejoice with me,” she says, “for behold, the Lord has given me the living Pavilion of His divine glory, unto the joy and gladness of us all and the salvation of our souls. * The holy parents of the Mother of God received from heaven a gift worthy of God, a throne higher than the very cherubim [Is. 6:1; Ez. 1:4] — she who in childbirth would bear the Word of the Creator. 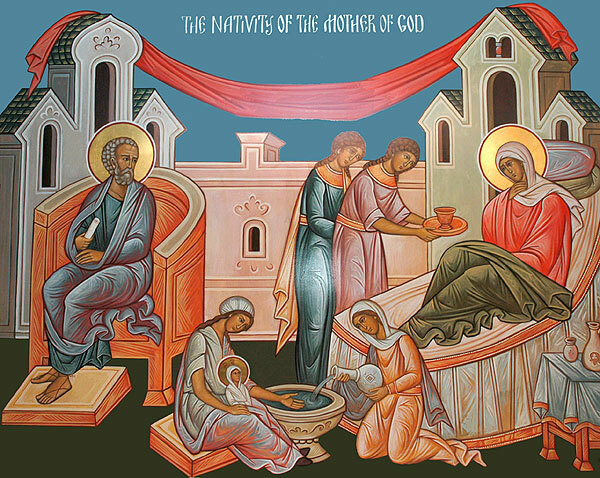 * The Mother of God was born to us at the holy Sheep Gate. Rejoice, O Sheep Gate, the most holy temple of God’s Mother. Rejoice O Sheep Gate, the wall of Joachim’s sheep. * The present feast honoring the birth of the Virgin Mother of God easily carries off the glittering prize of seniority against every competitor…for without the Virgin’s feast none of those that sprang out would appear…The Virgin’s feast, in fulfilling the function of the root, the source, the foundation…takes on with good reason the ornament of all those other feasts, and it is conspicuous with many great boons, and is recognized as the day of universal salvation. * After God had bestowed on man the enjoyment and mastery over everything in the Garden, it was meet for him who was entrusted with so great authority to be disciplined and trained with some command. However, after transgressing this command, the Creator did not overlook His creatures though they had plunged themselves into such great error. It was needful, therefore, that one Person of the Trinity become man, to make it manifest that the recreation too, like the creation, was their own work. Incarnation entailed a pregnancy and a mother. So it was needful that a mother should be prepared down below for the Creator, for the recreation of shattered humanity. 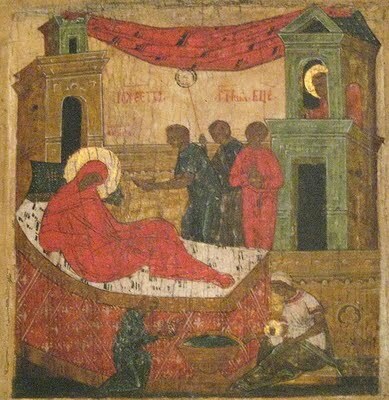 She was to be a virgin, just as the first man had been formed of virgin earth; so the recreation too should be carried out through a virgin womb, and that no transitory pleasure, even lawful, should be as much as imagined in the Creator’s birth; for the Lord suffered to be born for the deliverance of him who was a captive of pleasure. Who then was worthy? Clearly it was she who this day strangely issued from Joachim and Anna, the barren root. It was needful, yea needful, that she who from the very cradle had by a superior reason preserved her body pure, her soul pure, her thoughts pure, should be marked out to be the Creator’s Mother. It was needful that she who had been brought to the temple as an infant, who had trodden the untrodden places, should appear as a living temple for Him Who gave her life. It was needful that she who had been born in a wondrous manner from a sterile womb, and had removed her parents’ reproach, should also make good the failure of her forefathers; for she, the descendent, was able to repair the ancestral defeat, who brought forth the Savior of our race by a husbandless birth, and molded His body. * The Lord’s throne (Mary) is being prepared on earth, earthly things are sanctified, the heavenly hosts are mingled with us, and the wicked one, who first deceived us, has his power crushed, as his wiles and devices rot away.